BAMMA & Bellator announce their return to Newcastle with one of the UK’s biggest MMA events of the year. The Metro Radio Arena prepares itself for an explosion of MMA entertainment on 15th December 2017, as two of the world’s leading MMA promotions join forces to bring the Christmas party to the North East. Featuring the region's biggest stars; Colin ‘The Freakshow’ Fletcher, Ryan Scope and Geordie Shore’s Aaron ‘The Joker’ Chalmers on the fight card, alongside former world title challengers Michael ‘Mayday’ McDonald and Valerie ‘Trouble’ Létourneau will make their in-cage Bellator debut, fight fans are guaranteed non-stop action all night. With a full supporting fight card to be announced, get ready to buckle up for the one MMA event of the year that you simply won’t want to miss. Tickets for BAMMA/Bellator Newcastle go on sale Friday 6th October, so make sure that you grab your tickets quickly as this event is sure to be a sell out. For more information please visit bamma.com.? 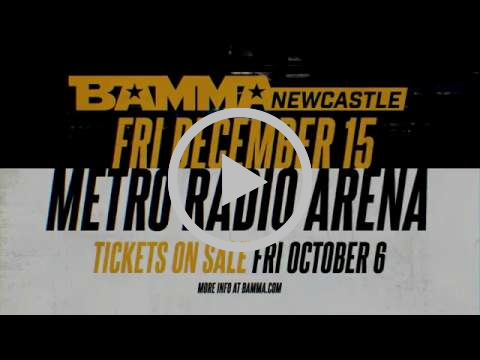 BAMMA/Bellator Newcastle takes place at The Metro Radio Arena, Newcastle on Friday 15th December and tickets are on sale on 6th October. Metro Radio Arena, Newcastle Friday 15th December 2017. Do NOT Crop or reproduce the attached artwork in any way without prior written permission. BAMMA, Europe's Leading Mixed Martial Arts Entertainment Brand, is the home for elite fighters from around the world. Launched in 2009 and drawing unrivalled domestic viewing figures, the UK based promotion continues to showcase the most exciting and entertaining fights, between the toughest and most skilled competitors the sport has to offer. BAMMA is brought to you in association with official broadcast partners, Dave, who are part of the award-winning commercial broadcaster UKTV who’s reach is over 41m viewers per month. UNILAD is the number one content publisher on social media and – with just under a billion engagements and over 25 billion video views in 2016 alone – has matured into the most engaged and viewed channel in the world. Established in 2014, UNILAD has grown from a single Facebook page and website for the social generation to a highly-engaged suite of channels catering for passions and interests such as food, tech and gaming. Initially only licensing viral content, UNILAD has now evolved into a leading original content producer, blending the best viral videos with home-grown content built for social and becoming one of the fastest growing media properties in the world.